Open Europe: Let's dare to have less Europe! As leading UK politicians and commentators urge eurozone countries, above all Germany to take the plunge into a fully fledges fiscal and economic union (while firmly rejecting the UK’s participation), it seems they have failed to contend with quite how deep resistance to such a move might be. Indeed we are beginning to witness a bizarre spectacle in which the UK is arguing for more EU intervention while many on the continent are arguing for less, a complete turn-around from recent history. Surely these are the sort of sentiments that constructive UK EU-reformers ought to be embracing? 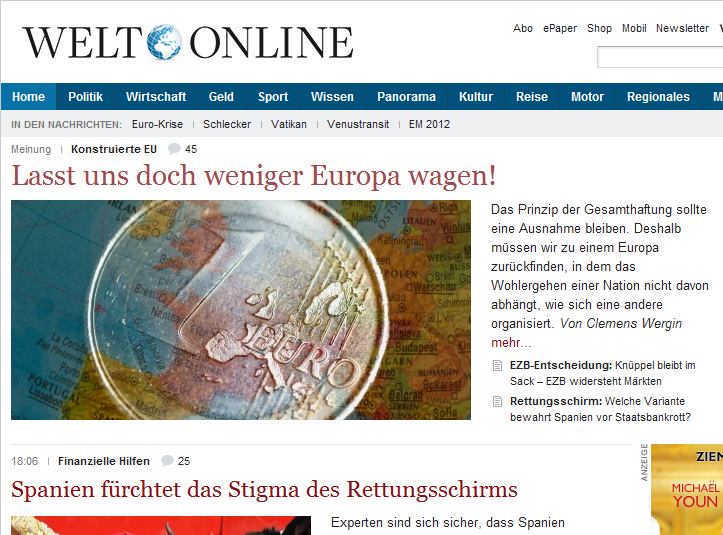 I totally agree with Die Welt's sentiments. The European political elite continue to assume arrogantly that they know what is best for all us little people of Europe whom they seem to believe would degenerate into a war mongering mob without the input of their supreme combined intellects. They continue to advocate 'more Europe', meaning that more integration is the right solution to the current financial crisis but right for whom? Perhaps that would keep their gravy train on the rails for a while longer and satisfy the thieving bureaucrats and tax dodgers in the South but it would not be best for the hard working people of Germany and the North who would have to pay the bill, - FOR EVER. It would also not permit the working people of the South the full democratic rights they so richly deserve. I have great sympathy with the German people on this issue. World War II ended in 1945 and the children and grand children of that generation should not be obliged to compensate the rest of Europe for ever for their forebears mistakes. All Europe requires to be prosperous is the Common Market that its UK supporters voted for in 1975, along with a massive reduction of bureaucracy from Brussels and time for Europe to heal and join together naturally. Trying to apply a straight jacket to large numbers of people in Europe, financial or otherwise, is not the route to peaceful coexistence but a recipe for disaster. Germany is the main beneficiary of the Euro, the exchange rate of the Euro is much lower than the D/mark would be therefore German exports benefit. The poorest countries subsidise this by having a Euro overvalued compared to the Escudo, Punt, Lira, Peseta or Drachma. Returning to their original currencies would after a period of turmoil assist Portugal, Spain, Italy, Greece and Ireland to recover somewhat. Closer union will only bring misery to a Europe dominated by Germany. The UK is not clamouring for closer federation in Europe: but an ignorant prat, not part of the disastrous eurozone, is trying to gain brownie points here by seeming to give advice: let me put on my 'tough stance' face and speak to Merkel! His success is marked by the fact that the electorate here prefers Miliband and Ed Balls compared to his Utter Balls. Let's not kid ourselves, Germany knew exactly what they were getting into in 2000. Their economy was flatlining then and they saw the Euro as a quick fix to sell their products to the Eurozone (eg two submarines to Greece - what?). Helmut Kohl said in 1986 "there can be no monetary union without fiscal union" and he was right then and he's right now. Let's get this straight. Germany did NOT want to give up the DM. 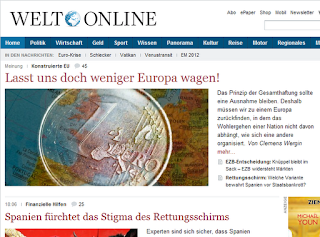 It was forced to give up the DM and accept the euro as the WWII Allies' cost to reunification. It is true that the euro helps German exports, but only at the expense of the non-exporting, non-unionized average German citizen, whose taxes go to the Stability Fund so that Greeks can import German cars. So the average German citizen actually pays Greeks to buy German cars. Needless to say, this arrangement will not last.